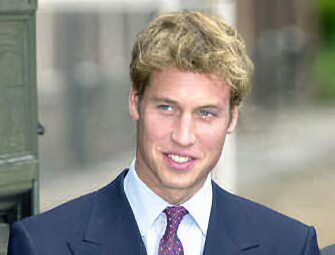 Prince William, the eldest son of Charles, Prince of Wales and Lady Diana Spencer was born on 21 June, 1982 at St. Mary's Hospital, Paddington, London. He was christened William Arthur Phillip Louis in the Music Room at Buckingham Palace by Dr. Robert Runcie, Archbishop of Canterbury. William wore the honiton lace christening gown made for Queen Victoria's eldest daughter, Vicky, which has traditionally been worn by members of the royal family ever since. 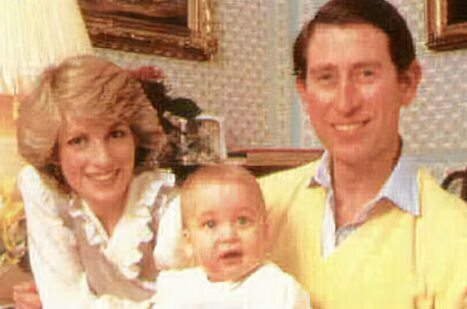 The Wales family was completed two years later with the arrival of a second son, Prince Henry of Wales, known as Harry on 15 September, 1984. A fair haired little boy with blue eyes and at the time not at all camera shy, he was sent Mrs. Mynors Nursery School in West London, where he was reported to be good at spelling, reading and swimming, a sport in which his mother, Princess Diana, had excelled. William was a mischievous toddler, who delighted in flushing his father's shoes down the toilet. He went on to attend Wetherby School, also in West London. His first official public engagement took place when he was eight years old, when he accompanied his parents on a visit to Wales on 1st March, St.David's Day, 1991. On 3rd June, 1991, William was admitted to hospital with a depressed fracture of the skull, which occurred during an accident with a schoolfriend and involved a golf club. His mother remained at his bedside, while his father became the subject of widespread negative criticism in the press when he continued to carry out a scheduled engagement that evening. The prince 's education was continued at Ludgrove School, in Berkshire, where he played in the school's football, basketball and swimming teams and became captain of the school rugby team. William also enjoyed acting and performed in several school plays. Since his father was adamantly opposed to sending his sons to Gordonstoun, where he himself had been profoundly unhappy, William was later enrolled at Eton College. While the prince was at Eton, his parents deeply troubled marriage ended in a highly publicised divorce, with their squabbles and differences being endlessly discussed in the press. Dubbed the War of the Wales's, the bickering escalated as the friends of one side continually tried to score points over the other. His house master, Dr. Andrew Gailey, is said to have supported William through this traumatic time. During his time at Eton he also frequently visited his grandmother, the Queen, at nearby Windsor Castle, who has been involved in his upbringing and is said to be extremely fond and supportive of her grandson. When his mother died tragically in a Paris car crash in August, 1997, the fifteen year old prince was spending the summer holidays at Balmoral, the Queen's Scottish estate, along with the rest of the royal family. William and his brother Harry attended Crathie Kirk the following morning, along a route lined with mourners, later returning to London to view the mass of floral tributes left by members of the public to their mother and to meet some of the mourners and well-wishers who crowded the London Streets outside of his mother's home of Kensington Palace. At the funeral, William and his brother Harry insisted on performing the grueling task of walking at the head of the cortege which followed her coffin, carried on a gun carriage to Westminster Abbey along with their father, grandfather and maternal uncle, Charles, Earl Spencer. Both boys, despite being deeply affected by the loss of their mother, displayed much composure and dignity. William left Eton at eighteen years old having acquired twelve GCSE's and three A levels, gaining an A grade in geography, B in in history of art and C in biology. He announced that he was "grateful to the media for helping protect my privacy and I hope I can enjoy the same freedom at university." Prince Willaim chose to have a gap year before entering university and during that time he did voluntary work in Chile, through Raleigh International, an organisation which takes young people on expeditions to assist in environmental and community projects. William became a popular member of the team, performing many manual tasks, even taking his turn in cleaning the toilet. A television programme documented his time there. He also spent some time in Africa, a continent he is known to be highly interested in, where he studied conservation. After his gap year, William entered the University of St. Andrew's, Fife. In an interview marking the start of his university career he insisted "I just want to go to university and have fun - I want to be an ordinary student." Although originally studying the history of art, he later changed his mind and switched to geography. William became close friends with his flat mate and fellow student Kate Middleton, an attractive brunette who was later to become his steady girlfriend. She has since accompanied William and his family on several skiing holidays. In an interview to mark his 21st birthday he said " I want people to call me William for now. I don't want all the formalities because they're not needed for the time being." As regards rumours that he does not want to inherit the throne he is on record as stating " Its something I was born into and its my duty. These stories about me not wanting to be King are all wrong. Its a very important role and one that I don't take lightly. Its all about helping people and dedication and loyalty, which I hope I have - I know I have." In December, 2005, he became patron of the Tusk Trust, an African conservation trust based in the UK, he also became patron of Centrepoint in May 2006, a charity for homeless young people, his mother had previously been patron and it was a cause very dear to her. William had often accompanied her on visits to Centrepoint shelters as a child, where he had learned much about the charity's work. William decided on a career in the armed forces and enrolled as an officer cadet at Sandhurst Military Academy, joining his younger brother, Prince Harry, who was already there. William has matured into a striking young man, with a strong resemblance to his mother. Uncommon in the House of Windsor, he is tall, measuring 6' 3". William is left handed, like his great-grandfather, George VI. In a recent interview, he stated that he enjoyed " being with my friends, going to the cinema and watching football and rugby matches." he is also known to like swimming and tennis. When he does succeed to the throne he will reign as William V, unless he specifically choses to reign by one of his other Christian names. After much speculation in the press that William would soon propose to his girlfriend of nearly five years, Kate Middleton, whom he met at St. Andrew's University, the Sun newspaper broke the story on 14th April, 2007, that the couple had split up. According to newspaper reports, the decision to end the relationship was made during a holiday in the Swiss resort of Zermatt. There has been much speculation about the reasons for the split, which include that Kate felt William had not been paying her enough attention and that William had been photographed with other young women at a nightclub. William is on record as saying that he is far too young to marry. Some reports state that he had received advice from other members of the Royal family not to rush into marriage. By June of the same year they had, however, the couple resumed their relationship. To celebrate the life of his late mother, Diana, Princess of Wales, William, along with his brother Harry, organized the Concert for Diana, which was held at Wembley Stadium on 1 July, 2007, on what would have been the Princess' 46th birthday as well as a memorial service to mark the tenth anniversary of her death on 31st August, 2007 at the Guard's Chapel. The concert, featuring a host of stars including Elton John, Rod Stewart, Duran Duran and Joss Stone, was a great success, about 60,000 people attended the event, while around 15 million people from across the UK watched Concert for Diana at home, and it was broadcast to over 500 million homes in 140 countries. Profits from the concert were donated to three charities Sentebale, Centrepoint and the Diana, Princess of Wales Memorial Fund. Prince William said: " For us, this has been the most perfect way of remembering her. And this is how she would want to be remembered." The memorial service was not without controversy, the Duchess of Cornwall had initially accepted an invitation to the event from the Princes, but following complaints from the public that her attendance would be inappropriate, she stepped down, stating that she did not wish to be a distraction. 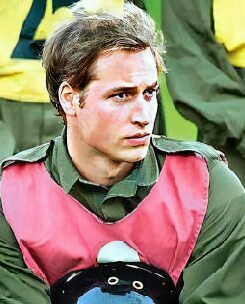 William was commissioned as a Lieutenant in the Blues and Royals Regiment of the Household Cavalry, where he served with his brother Prince Harry. Two years later, he earned his wings by completing pilot training at Royal Air Force College Cranwell. In 2009, he was transferred to the Royal Air Force, was promoted to Flight Lieutenant and underwent helicopter flying training in order to become a full-time pilot with the Search and Rescue Force. In 2010, he completed his general and special-to-type helicopter training and went on to RAF Valley on No. 22 Squadron performing co-pilot duties on board a Sea King search and rescue helicopter. Prince William finally proposed to his long time girlfriend Kate Middleton on October 19, 2010, At Lewa Game Reserve in Kenya. The couple married on 29 April 2011 at Westminster Abbey. Before the wedding, it was announced that William had been given the titles, Duke of Cambridge, Earl of Strathearn and Baron Carrickfergus by his grandmother the queen. On 3 December 2012, it was announced by St James' Palace that the Duchess of Cambridge was pregnant and expecting the couple's first child. The Queen declared that the Duke's children would be princes and princesses with the style Royal Highness. New legislation will end the principle of male primogeniture, meaning that the first child of the Duke and Duchess of Cambridge will succeed to the throne, regardless of whether the baby is a girl or a boy. The legislation will also end the bar on anyone in the line of succession marrying a Roman Catholic. The couple's first child, a son, was born on 22nd July, 2013 in the at the private Lindo Wing of St Mary's Hospital in Paddington, London weighing 8lb 6oz. Prince William was present at the birth of his son. Prince George Alexander Louis of Cambridge is third in line to the British throne, after Prince Charles and Prince William, displacing Prince Harry in that position and is destined to become the 43rd monarch since William the Conqueror took the throne in 1066. Prince William said the couple "could not be happier". The royal couple's country residence Anmer Hall, a ten-bedroom a Georgian country house on the Queen's Sandringham Estate in Norfolk, was a gift from the Queen. Anmer Hall is more conveniently located for William's new role as a pilot for Bond Air Services, a helicopter operator that works with the East Anglian Air Ambulance service. The Duke and Duchess of Cambridge's second child, Princess Charlotte Elizabeth Diana was born on 2nd May, 2015. A third child Prince Louis Arthur Charles was born on on St. George's Day, 23rd April, 2018.